LOVE IS IN THE AIR… Love your body too! 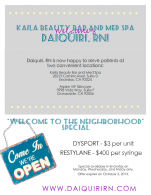 WELCOME TO THE NEIGHBORHOOD SPECIALS We’re Open at Kaila Beauty Bar and MedSpa! ❀Dysport – $3 per unit ❀ ❀ Restylane – $400 per syringe ❀ expires 10/2/2013 Good at the ENCINITAS KAILA BEAUTY BAR LOCATION ONLY CLICK HERE to make your appointment today! Happy Spring! Let’s Get Ready for Summer!!! Daiquiri Rankin, R.N., and Sam Hood, R.N., at Aspire VIP Skin Care want to help you look your best for the summer! Let us help you get that glowing look for summer…Call today to book your appointment.